How does Smart SDP help our overall business performance? How Flexible is Smart SDP? What Cost Savings does Smart SDP Deliver? Smart SDP is Telemune's Managed VAS platform that delivers a complete portfolio of VAS – from voice & call management, to messaging and data apps - from a single platform. The Smart SDP platform provides access to a complet VAS ecosystem, which is resource efficient, easy to manage and quick to scale. 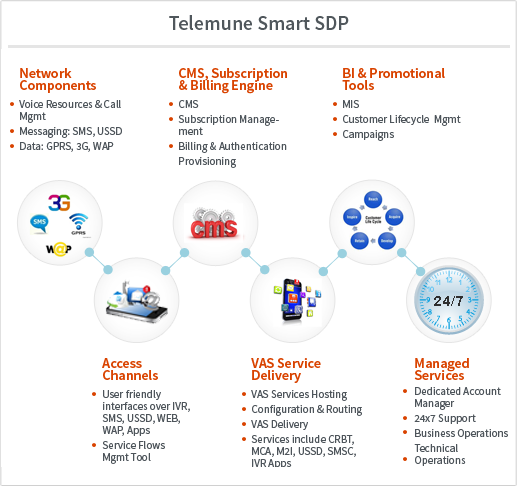 Smart SDP forms the foundation of Telemune's Managed VAS offering. The platform addresses major requirements for operators offering VAS - it integrates easilywith the network and internal and third party systems and it has an in-built billing engine, content management system, subscription manager and campaign manager - as well as business intelligence tools. Telemune delivers all VAS services from this platform, ensuring operational efficiency and enabling marketing effectiveness.